Well, I've said many times that I love non-traditional colors for Christmas, so here's a bit more proof! 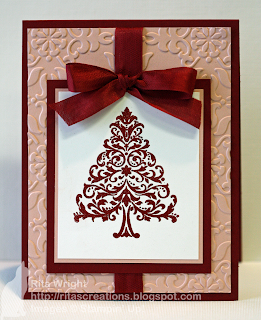 When I saw the color combination at Just Add Ink this week, I knew I'd be doing a Christmas card. Cherry Cobbler always makes me think Christmas and I knew I could somehow work in Blushing Bride with it. One of my favorite products is Cherry Cobbler seam binding, so that was my first thought when I saw the Pals Paper Arts challenge to use ribbon. Nothing makes bows quite like the seam binding. I love it! Beautiful card! I love the colors and I think it looks very elegant. Thanks for sharing! Cherry Cobbler is my absolute favorite SU color - and I love the seam binding! I never would have paired it with pink and you made it look fabulous! Love those two colours together! Very pretty. Have a great weekend! 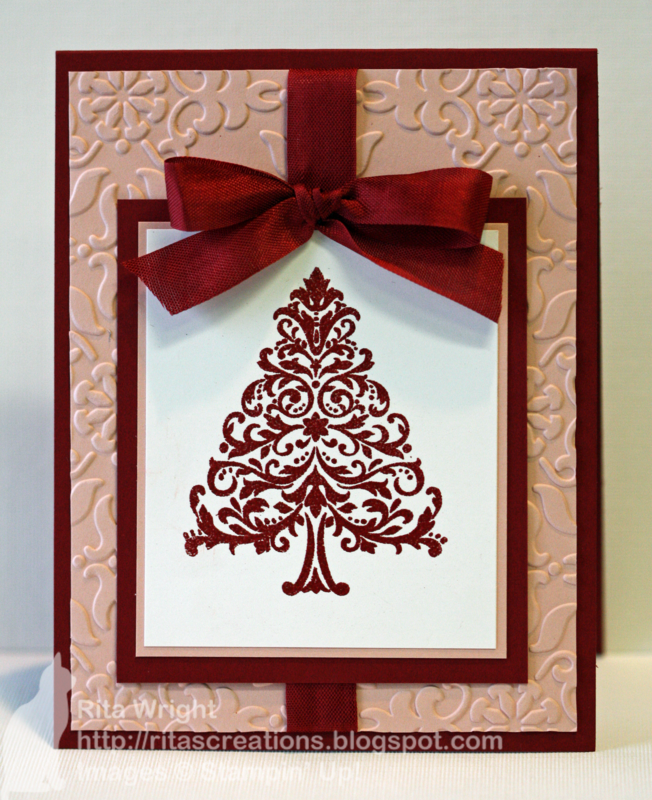 The colours work together so well and you have made a very elegant Christmas card. Thanks for joining in with the challenge at JAI. Another beautiful card!! Love that color combo!! You are wonderfully unique in your stamping style. This is a stunning card Rita! Rita, I love this card ... I will definitely be CASE'ing this one! This is gorgeous Rita! Love the seam binding bow. Thanks for playing along with us at Just Add Ink this week! This is another gorgeous Christmas card from you Rita. (You are so good at creating them:) I love the bow especially! It's so gorgeous. Glad you could play with us at JAI this week. Classic and very classy Christmas card Rita! Love the sema binding bow. Thanks for playing at Just Add Ink. Just lovely. The seam binding bow sets everything off perfectly. Thanks for playing along at JAI this week. Love this card. Do you mind sharing the dimensions of each layer? I really like the layout, thank you for sharing.